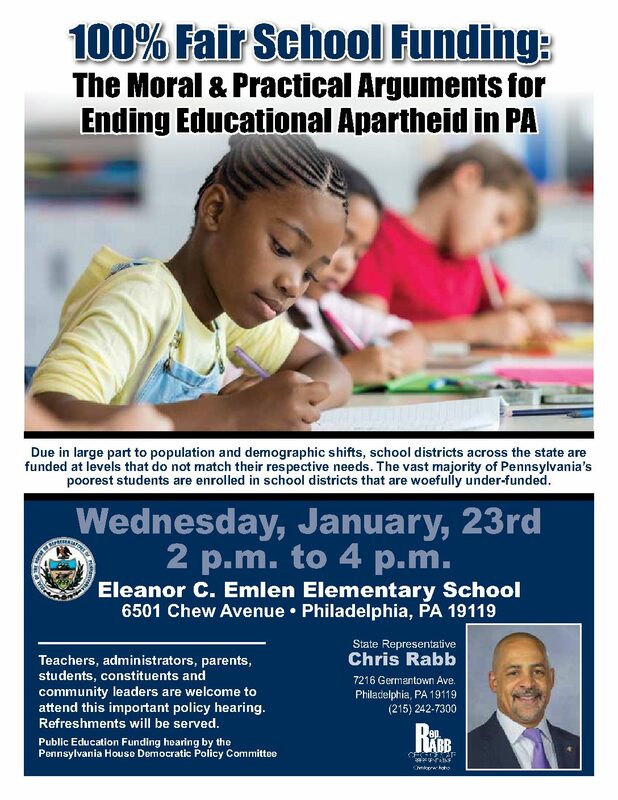 PHILADELPHIA, Jan. 18 – State Rep. Chris Rabb, D-Phila., will host a House Democratic Policy Committee public hearing to discuss the moral implications and practical solutions to addressing Pennsylvania’s ranking as the worse state in the U.S. on public education funding equity. The hearing will be held at 2 p.m. Wednesday, Jan. 23 at the Eleanor C. Emlen School, 6501 Chew Ave., Philadelphia. The media and public are invited to attend. The meeting is one in a series held across the state on House Democrats’ Plan4PA, focused on putting people first, good jobs, healthcare access, quality schools and jobs training, and a fair economy. Additional information about the plan is available at www.plan4pa.com. For more information about the Policy Committee, go to www.pahouse.com/policycommittee. No Replies to "Rep. Rabb to host Policy Committee hearing on fair school funding Wednesday in Philadelphia"